Closer home in Dubai, we spoke to Nick Wilkinson, vice-president and managing director for UK, Ireland, Middle East & Africa, Norwegian Cruise Line, for more regional insight. He was visiting the emirate as part of an annual roadshow that tours key cities in the Middle East meeting travel agents and consumers, sharing updates about Norwegian Bliss, which sets on its maiden voyage from Bremerhaven in Germany on April 19 this year. 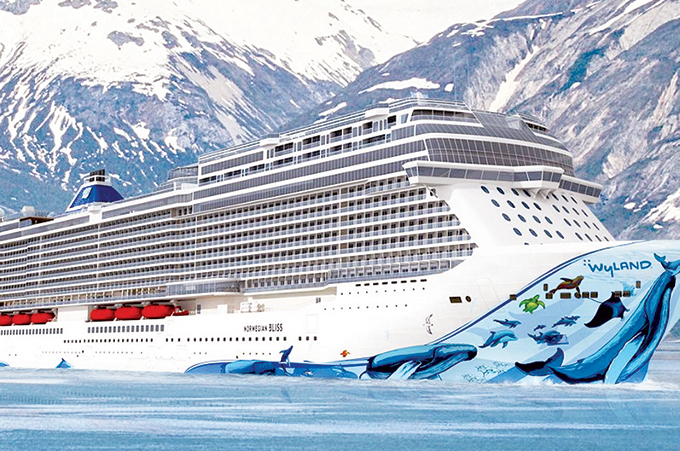 The main discussion on the agenda was the 16th ship of the Norwegian fleet, Norwegian Bliss, which is the first cruise ship custom-built with features and amenities for the ultimate Alaska cruise experience. Measuring 994 feet long, 136 feet wide and at a gross registered tonnage of 168,028, Norwegian Cruise Line will then begin her passage across the Atlantic Ocean on April 21 and will arrive to the US on May 3, where she will begin her inaugural tour, the most extensive of any ship in Norwegian Cruise Line history. Events will take place in New York City, Miami, and Los Angeles, and then will conclude with a christening ceremony on May 30 at the new Pier 66 at the Port of Seattle in Washington State, followed by her inaugural cruise. Norwegian Bliss will offer cruises to Alaska beginning June 2. She will spend her summer sailing seven-day cruises to Alaska and fall season cruising to the Mexican Riviera from Los Angeles. In winter of 2018 she will sail to the Caribbean from Miami, and in the 2019 fall/winter season she will cruise from New York City to Florida, the Bahamas and Caribbean.